Work: Elected to General Assembly of North Carolina, 1773; Member of Continental Congress, 1774-1776; Judge of the Federal Court; 1786. William Hooper was born in Boston Massachusetts in 1742. He graduated from Harvard College in 1760, continued his studies in the law, and settled in Wilmington, North Carolina in 1767. 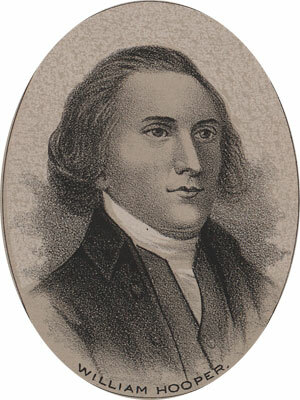 In 1773 he represented Wilmington in the General Assembly of North Carolina. He attended the Continental Congress in 1774. He resigned from the Congress in 1776 and returned home. In 1789 he was appointed to the Federal Bench, but a year later he retired due to failing health. He died in October of 1790.